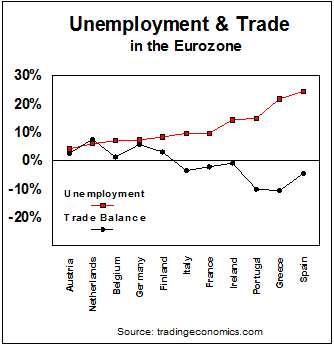 In contrast, the trade surplus countries of the Eurozone are doing quite well -- Germany, especially. Its unemployment rate is down to 5.2% today from 5.7% in 2012. If the Eurozone were truly integrated, as the United States is integrated, enough people would migrate from the depressed South to the prosperous North to even things out. But the current European migrations are not reducing southern European unemployment rates. It seems obvious that these five countries should leave the Eurozone in order to revive their economies. Once out, their currencies and the international value of their wages would fall to trade-balancing levels and they would start getting investment in their industries. They would prosper and their unemployment rates would shrink. The leader of France’s far-Right party has vowed that the European Union would “collapse like the Soviet Union” as she conspired to form what would be the most radical faction yet seen in the European parliament. Marine Le Pen, buoyed by a weekend by-election triumph in southern France, criticised the EU as a “global anomaly” and pledged to return the bloc to a “cooperation of sovereign states”. She said Europe’s population had “no control” over their economy or currency, nor over the movement of people in their territory. Ms Le Pen, 45, will next month travel to Holland to chart a joint campaign with Geert Wilders, whose anti-Islamic Freedom Party (PVV) currently tops national opinion polls for May’s European elections. Guy Verhofstadt, a former Belgian PM, urged mainstream parties across Europe to stand firm against the forces of extremism that fuelled the Second World War. “If we allow these forces to gain a foothold once again on our continent we will have wasted a century of building closer ties and condemned history to repeat itself,” he said. President François Hollande of France warned this week that the prospect of a significant anti-EU grouping could lead to “regression and paralysis” in Europe, adding that it could threaten the continent’s ability to recover from the after-effects of the crisis in the Eurozone. Those on the European right have a solution which would restore prosperity to their countries. Meanwhile, the elites of these countries have become so blinded by internationalism that they can offer nothing better than perpetual depression.